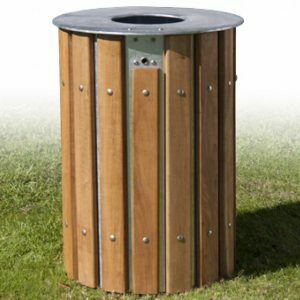 The robust EURO waste container is constructed of durable hot-dip galvanised mild steel, attractively finished with sustainably sourced hardwood slats. All our bins are designed to be long lasting and low maintenance. Windsor Urban custom, secure, quick-release hex-key latch system enables easy access to the the galvanised liner for emptying and cleaning and reduces potential vandalism. Our fixing bar mounting system makes installation low cost and ensures the durability of the container. Being mounted firmly to the ground reduces vandalism and potential theft. The semi-covered design enables better containment of waste. 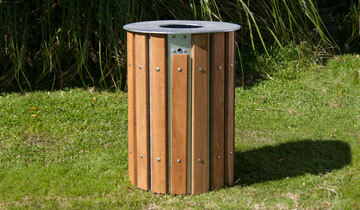 All our bins are designed to be aesthetically pleasing, long lasting and provide lower maintenance and running costs. Mild steel construction, hot-dip galvanised. All litter bins are supplied with galvanised steel liners. The sustainably sourced hardwood slats are treated with an environmentally friendly, durable preservative finish. Your logo, badge or crest may be incorporated into the design on request. Round waste containers are designed for fixing bar mounting.